Dua Ahad is a short dua that when recited, is a renewal of our covenant of allegiance to the Imam. Why not switch it on every morning while the children are getting ready for school? It will hopefully familiarise them with the recitation, and even younger children can join in with the ending where it repeats three times: Al-Ajal, Al-Ajal Ya Mawlaa Ya Saahibuz Zamaan – Hurry! Hurry! Oh My Master, Oh Master of the time. In Iran, they switch on this dua as everyone is making their way to their classes, and when it comes to this bit, everyone stops and joins in – it’s a wonderful feeling! 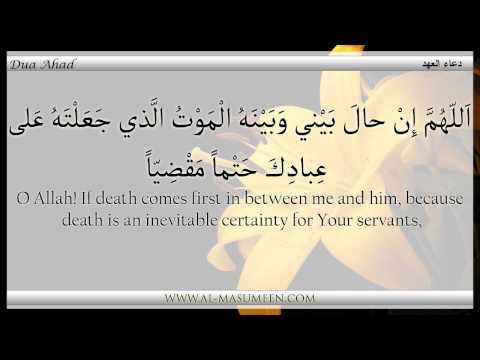 Depending on the age of your child, you can explain why you are switching on this dua in particular, and especially explain the importance of the ending – of how we are waiting for him – hopefully it may lead to more discussions on him, why we are waiting, what he will do when he comes, etc. P.S. Imam Sadiq (a.s) narrates that “one who recites this supplication for 40 mornings; he will be accounted amongst the helpers of Imam Mahdi (a.t.f.s). And if he happens to die before the reappearance of Imam Mahdi (a.t.f.s), Allah will raise him up from his grave so that he may assist the holy Imam (a.t.f.s). For every word that he recites in this supplication, Allah will grant him 1000 good deeds and will erase from his scroll of deeds 1000 sins”.